I have been waiting for this to rock up for a while. It was supposed to be release earlier this year, but on hit the streets recently. By luck, I ordered one and expected to get it at the end of May, but it turned up within a week. Why did I want one? Well I have been using Tablet PC’s for a while. I used my first one when I worked for Microsoft many moons ago. It was a Toshiba M400. I then purchased one and we have a nice life together. It was only pen, but good. I then upgraded to a Toshiba M750 which had touch and pen. It was good but Windows 7 didn’t really do it justice. In a fit of madness I got my hands on a Asus EEE slate. Again windows 7 was okay on it, but the device was heavy. Next on my purchasing history was a Surface RT. I like this! Windows 8 rocks and touch is just amazing, but I wanted to Ink. The helix had everything I was looking for. Touch and Ink, detachable screen, processing grunt and a decent amount of RAM. 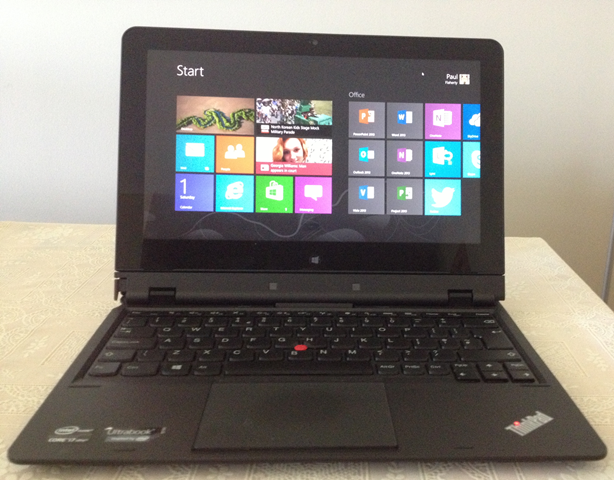 It is pegged as a business laptop, but the price point seems too high for general business use. So meet my Lenovo Helix. 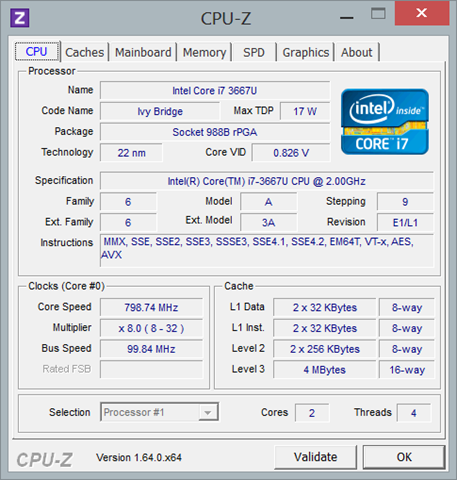 I have the the top end Core i7 with 8GB RAM, and 256GB SSD. Out of the box there isn’t too much bloatware. For those of you that have used or see a Surface RT, it is on the top and the helix on the bottom. The phat club measuring is interesting. 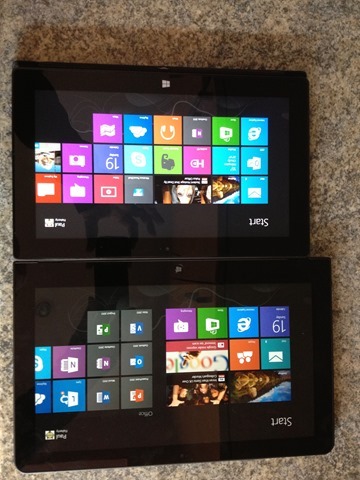 The Surface RT comes in at 894g The helix with keyboard dock is 1689g, while the screen is a feather weight 851g! Lighter than the Surface RT! 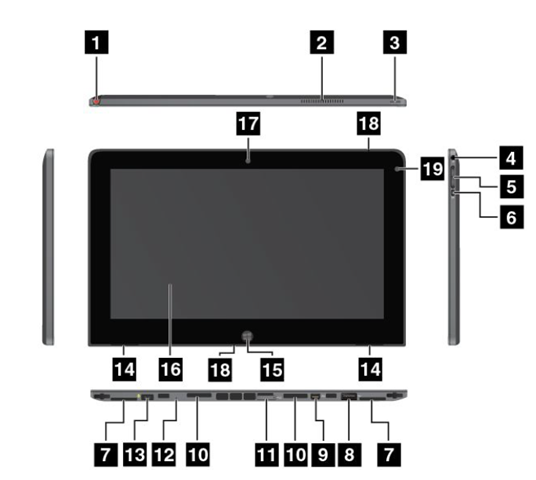 The tablet is the main unit of the product. 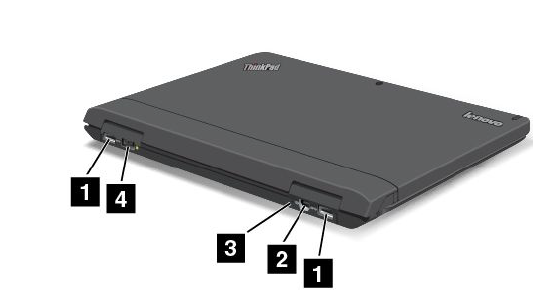 The keyboard dock is designed specifically for the ThinkPad Helix. It provides the function of a port replicator and holds the tablet in an upright position to provide a typing experience similar to that of a notebook computer. The illuminated ThinkPad logo on the palm rest functions as a system status indicator. This is the ONLY indicator light. How hard disk light nothing, but the the red dot on the doc and the back of the screen. Near Field Communication (NFC) logo. Interestingly this weekend I have gone native with the Helix, attempting to use it alone for in my day job. Something that I have started to notice after using the keyboard is sometimes, some of the keys are generating a “ping” sound, and the buttons on the touch mouse occasionally do the same? Build quality issues? Connectivity is another interesting one. 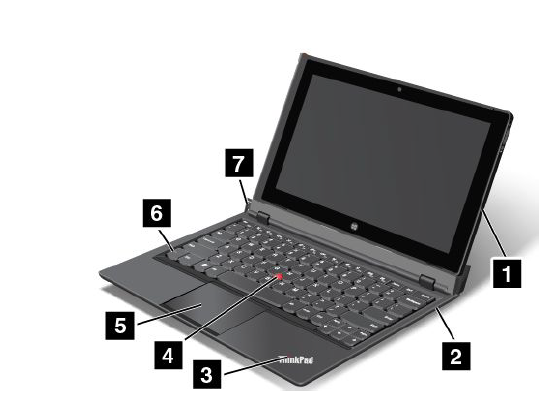 Most business laptops have at least 3 USB ports, but as you can see the Helix only has 2. Why is this an issue? Well looking at the ports you will see the Helix is missing a network port (yeah I now Wi-Fi blah, blah, blah). In the box they provide a USB to network adapter which is cool, but that takes a USB port. Which leaves one. Now an external mouse is nice, so that is port 2. Also external storage is a must, but with no spare USB ports your stuck! I know, a USB hub! great, but they don’t the grunt to power the external hard disk, and I really don’t want to have to carry another power supply with me to use a USB hub! Hey ho! Mouse or NIC or Hard disk? Next up is the screen. When you undock it you only have 1 USB port, and it’s on the bottom, so you are unable to utilise it when you are using the keyboard dock. So if your working on a document from say a USB stick and you want to switch to tablet mode, you have to save the document, undock the screen and they jack the USB stick in the bottom. It would have been really great if they have put a USB port in the side of the screen. On that note my big beef is that there is no SD or Micro SD slots. Instead on the bottom of the screen there are two stupid Label Trays (#7 in the picture above!) WTF why waste space with two bits of plastic, when they could have put an Micro SD connection instead. Another interesting thing again is that when you undock the screen you lose all your USB connections (No really!) so network connectivity wise you need to use Wi-Fi. However, in the box Lenovo provided a SIM card that you put in to the screen. This is essentially a Pay as You Go SIM. Lenovo has teamed up with Macheen to provide this service. The costs are actually quite good for 3G connections, and adds another element to the Helix. Not too sure how businesses will take this, but you can stick any SIM card in. I have tried it with a T-Mobile one and it works well. To fix the connectivity issues, I purchased one of the Lenovo USB 3 docking stations. It was a good buy. At home in my office I jack everything I want in to it, especially with the 5 USB 3.0 ports. You get a DVI port for an additional monitor as well as the mini display port adapter. The result are 3 screens, the laptop and two external monitor .. Shweet! Note to self, at some time I should get hold of a couple of touch enabled external monitors. 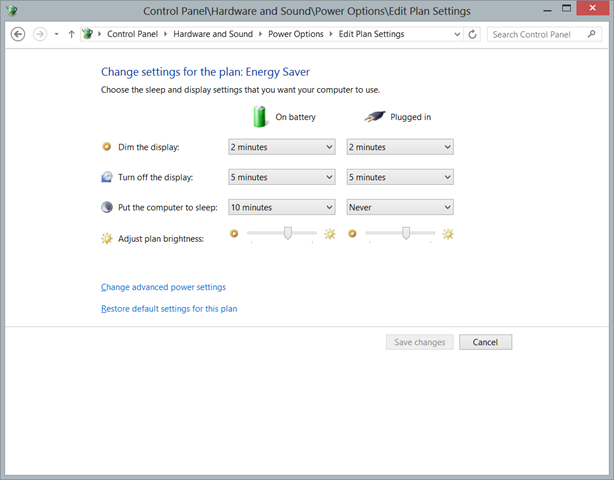 I change the Plugged in sleep settings to Never! Well I suppose i could myself a seasoned tablet user. One of the nice things when say using OneNote is that you can ink, then flip the pen around and you have an eraser. Humm not with the Helix! The pen only works with the pointy end and turning it around does nowt! Come on Lenovo get this the program! One good thing is that I can use the pen off my Toshiba M750 and both ends work! It appears that when you use “dock” the Helix pen, it turns on/off the digitiser on the screen, so when you use another pen you have to slide the helix pen up a few mm before you can user it. My Helix comes with Intel Widi <http://www.intel.com/support/wireless/wtech/iwd/sb/CS-032475.htm> Just by chance i read an article on The Verge talking out Intel chips. I checked the installed apps and hey there it is. So try it I purchased a Belikin Screencast from Amazon and jacked it into my TV. Wow that is easy. A few clicks and its on the big screen ! Like it! I have been using Windows 8 since it was available on customer preview. I love touch and ink. 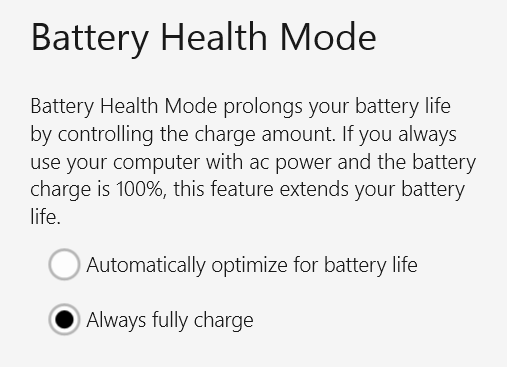 Microsoft has finally got with the program and developed an operating system that is truly user friendly. It funny, some of you maybe able to relate, but if I use my iPad, it automatically swipe up or right to left, or on my desktop touch the screen. Crazy but true! On the Helix it would fine. I have had a few issues, one is is when I shut the helix down, sometimes it crashed and restarts. Dunno why but it just does. Using Pro vs. RT is also a no brainer. 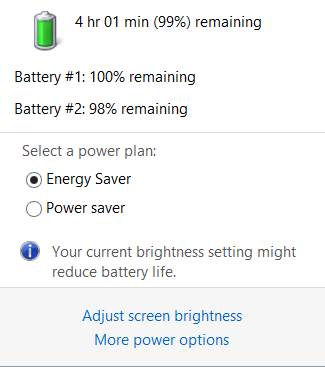 RT is okay for me, as the battery lasts a couple of days and I use it to watch movies or TV on the way to work. RT is probably equivalent to my iPad, but the only thing really missing are the Apps. The Apple Store is far better than the Windows Store. I want to be able to read magazines like wired in Windows 8, but this is just not possible at the moment. Come on boyz sort it out! so I can dump my iPad. Was my Lenovo Helix worth the money? This is the real question. When you look at the competition in the market place, and look at all the pros & cons, I would say yes. It does everything I want it to do. I have a few moans about it but that doesn’t stop me from using it. 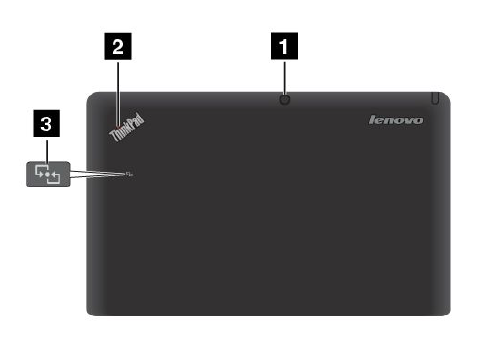 What I do find interesting, is this review on The Verge (http://www.theverge.com/2013/6/21/4445492/lenovo-thinkpad-helix-review) “The rest of the tablet’s bottom is full of ports that become completely inaccessible when you dock the device. There are two USB ports on the back of the dock, along with a MiniDisplay port; there’s a USB 2.0 port and another MiniDisplay on the tablet itself, plus SD and SIM card slots.”. Humm I don’t see an SD slot. Maybe they are reviewing a different model?